Posted on 2/23/2010, 12:00 pm, by jungrrl, under CrafTATstic Crafty Tattoos. I’m a sucker for a bird tattoo but this one is crafty, too! Craftster member MegPrice has this lovely birdie in honor of her father, who she says is the source of her crafty genes. Her father’s last name (and her maiden name) is Wrenn, so this lovely wren is perfect. 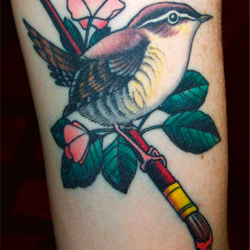 Add to that the lovely paint brush as a perch, and you have one crafty (and meaningful) tat! Thanks so much for sharing MegPrice! Beautiful tattoo. And how fitting!